The Dalmore 62 whisky is displayed in Singapore's Changi Airport. It may be the most expensive drink ever. A Chinese businessman has put down a deposit of $79,400 ($100,000 Singapore) on a bottle of Scotch whisky that goes for $200,000 ($250,000 Singapore). 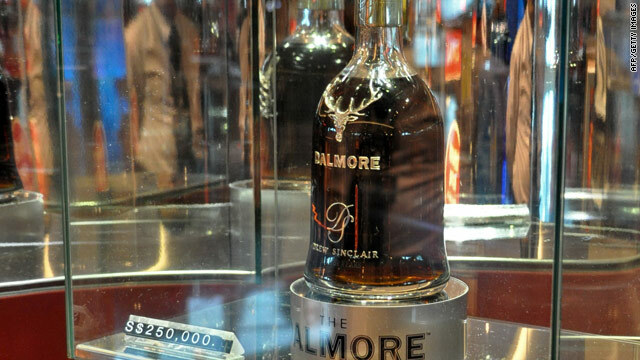 The 62-year-old bottle of Dalmore single malt is one of only 12 produced, according to a report on ChannelNewsAsia.com. The $200,000 bottle price amounts to about $12,000 per serving, the report said. The bottle of whisky is still on display at a duty-free shop in Singapore's Changi Airport. The businessman put down the deposit with a bank transfer, an airport spokesman told ChannelNewsAsia. The price breaks the retail record set by another bottle of the same brand three months ago, according to the Moodie Report. That bottle of Dalmore 64 sold in London for $188,000. Vijay Mallya , chairman of Whyte & Mackay and United Spirits, which owns the Dalmore brand, told the Moodie Report that whisky is a good investment. “The record breaking Dalmore 62 is an absolute bargain in my mind. The owner of this fabulous bottle now owns one of the rarest and most exclusive whiskies in the world. It’s a fantastic investment, rising in value by £100,000 ($157,000) in 10 years. How much will it be worth in another 10 years?" Mallya is quoted as saying. The Dalmore 62 was first offered for sale in 2002 at $39,000, according to the Moodie report. If it's not Jack Daniels you know you've paid way too much. "How much will it be worth in another ten years?" asks Mr. Mallya. Nothing – if the Chinese businessman drinks it! I have a "full" bottle of champagne that Celine Dion gave to everyone at her turn of the millennium, $520.00 a ticket Montreal concert on the 31st of december 1999 at midnight (new millennium) . Everybody opened their bottles to have a toast with Celine, but i didn't opened mine and I have decided to sell it if the price is right. Highest bidder. What a load of crock. 200,000 grand for a stinking bottle of hooch. No matter the cost, the end result is the same: it tastes like crap and if you drink enough, you get drunk. I'll give you $5 for it.